If you're looking for something a little different from your journey, Turners offer an array of travel services for business or pleasure and for any sized group. We can match your detailed requirements with a value for money, cost effective service. 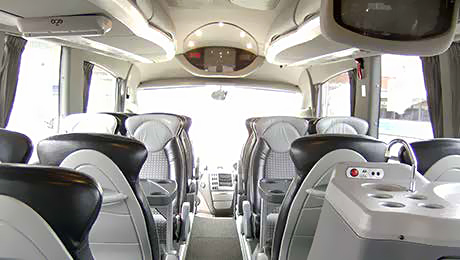 Whether you choose from our Executive range, our Standard range or our special 'Skool Bus' range, Turners provide the highest levels of comfort which means you can sit back, relax and arrive at your destination feeling refreshed and having had the best travel experience. Turners have an extensive fleet of well maintained, well driven, reliable and modern vehicles and we believe your journey should be relaxing and stress free. In the event of any issues Turners have a dedicated mobile technicians ready to assist in the situation that a coach has difficulties. Turners has a network of contacts around the country in the event of a breakdown or a replacement bus needed to get you from A to B! All Turners coaches run on low sulpha fuel and meet the level five of the European Emissions Standards (Euro 6).